Who said Melo had a hard job? 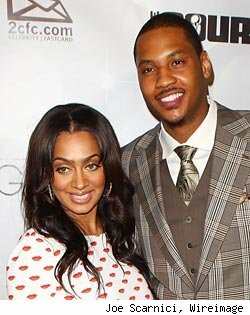 LaLa Anthony, Carmelo's wife, is preparing for an all new season of her reality TV show "LaLa's Full Court Life", premiering March 19 at 9 PM ET on VH1. LaLa is balancing motherhood with an upcoming role in the film "Think Like a Man" and the launch of a new make-up line- not to mention having to handle a relationship with one of the biggest sports stars in New York. Talk about a power couple.